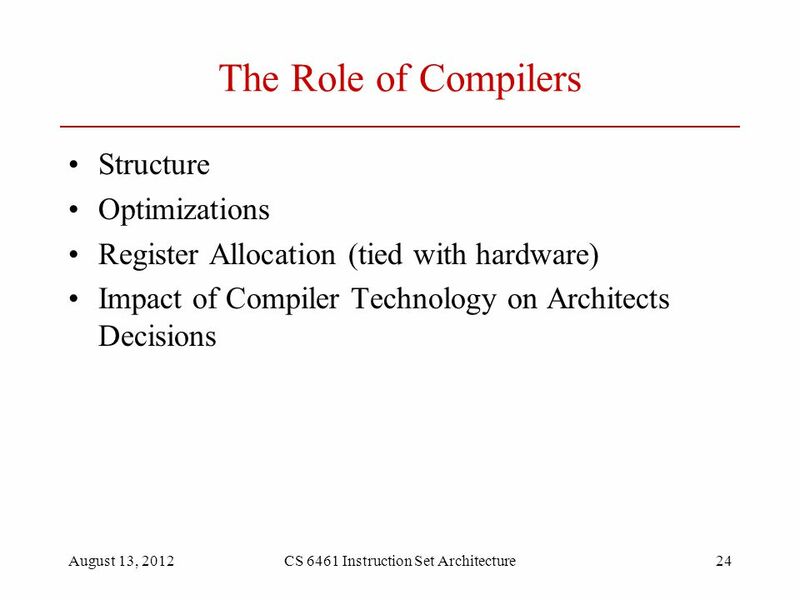 CS 6461: Computer Architecture Instruction Set Architecture Instructor: Morris Lancaster. 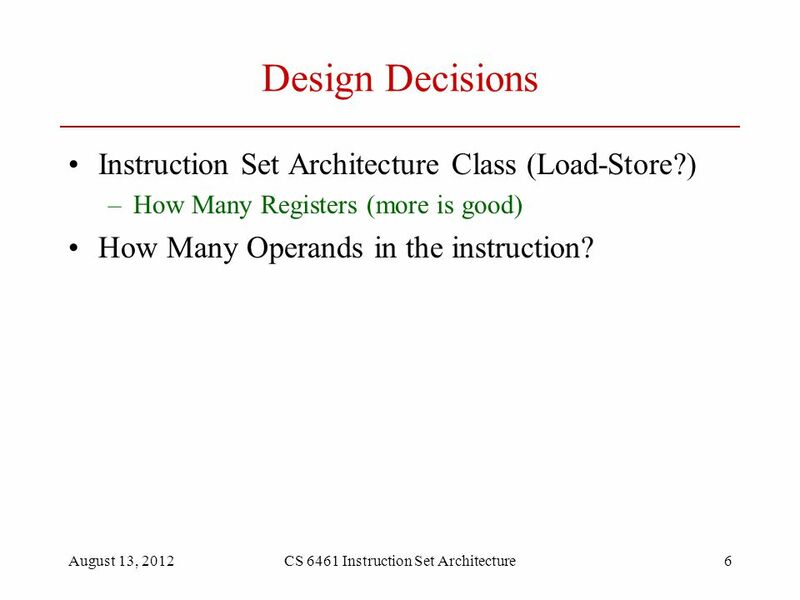 6 August 13, 2012CS 6461 Instruction Set Architecture6 Design Decisions Instruction Set Architecture Class (Load-Store?) 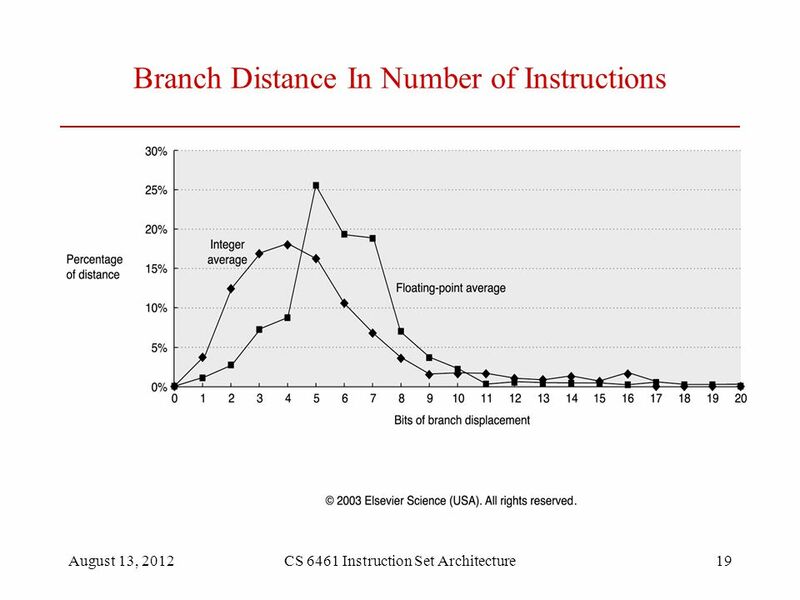 –How Many Registers (more is good) How Many Operands in the instruction? 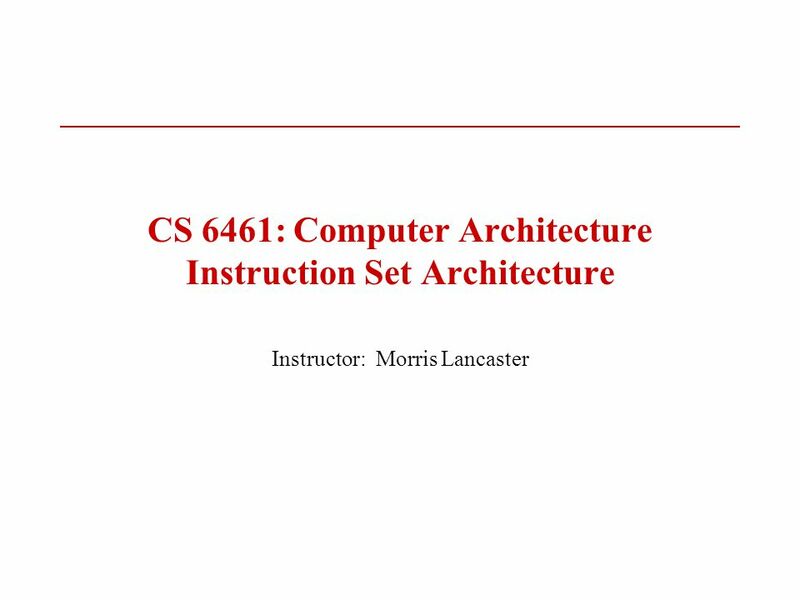 Download ppt "CS 6461: Computer Architecture Instruction Set Architecture Instructor: Morris Lancaster." 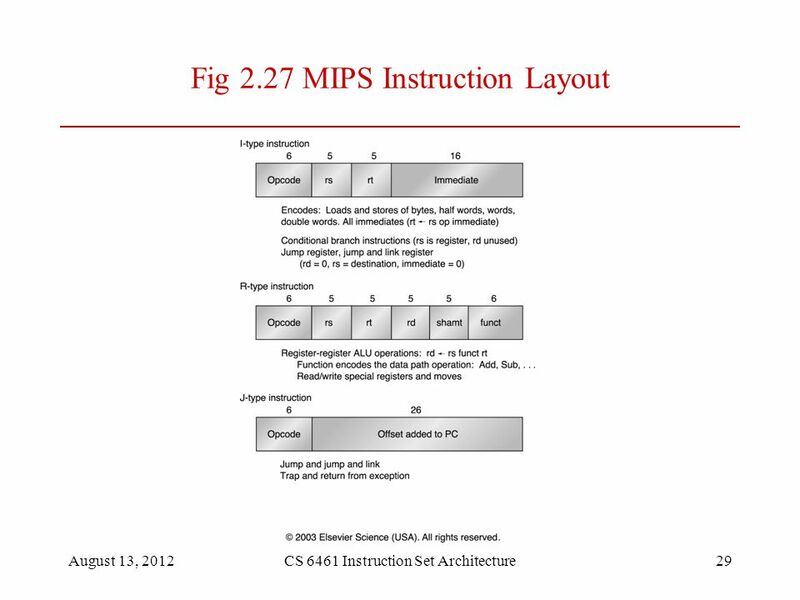 Chapter 2 Instruction Set Principles. 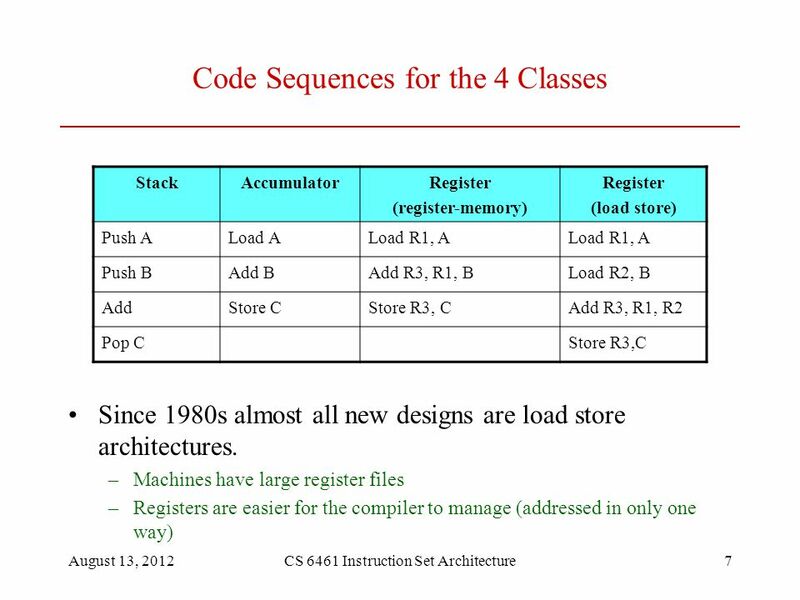 Computer Architecture’s Changing Definition 1950s to 1960s: Computer Architecture Course = Computer Arithmetic 1970s. 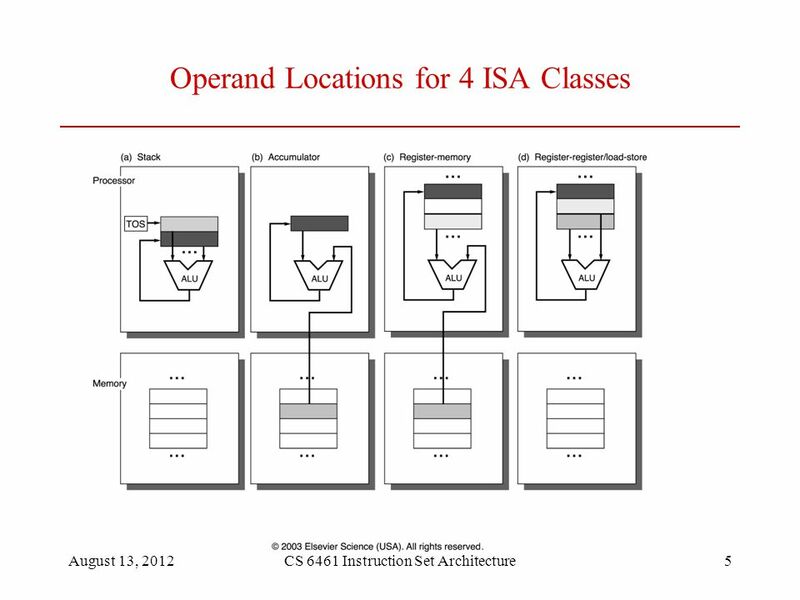 Chapter 3 Instruction Set Architecture Advanced Computer Architecture COE 501. 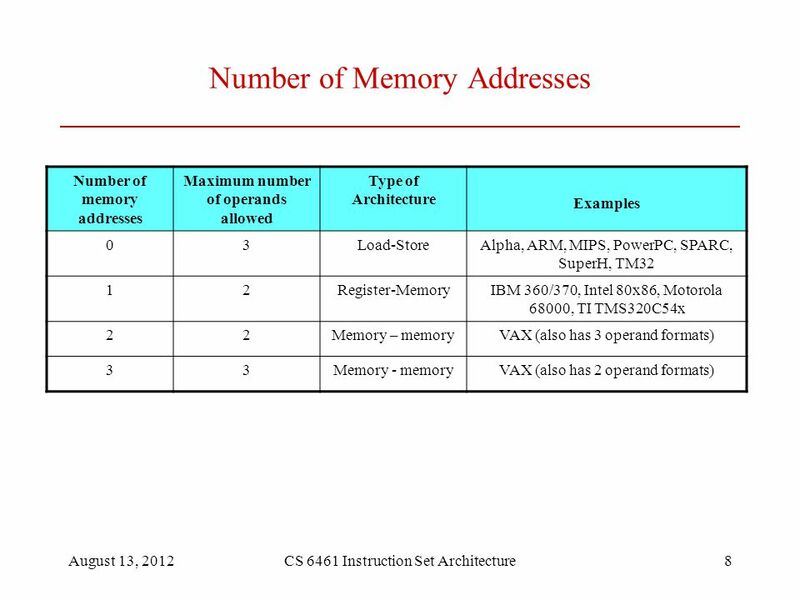 CPU Review and Programming Models CT101 – Computing Systems. 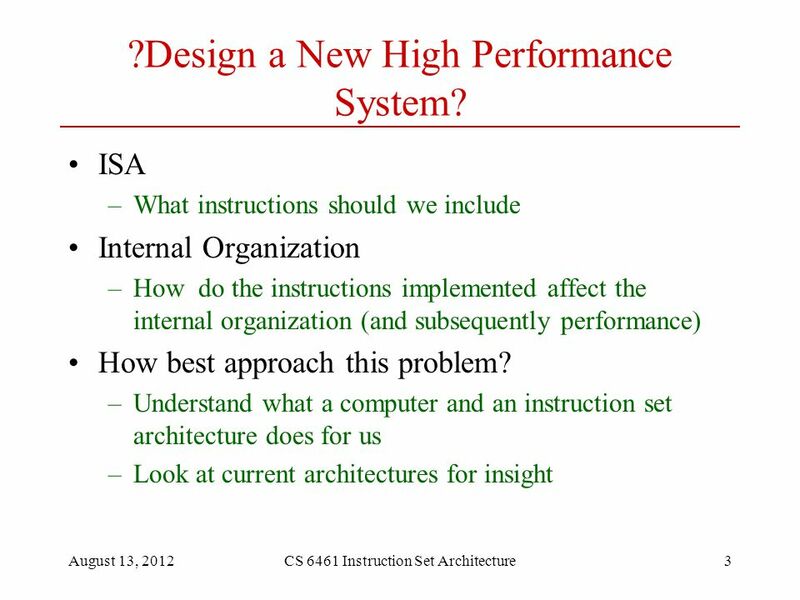 by Wannarat Computer System Design Lecture 2 Instruction Set Architecture. 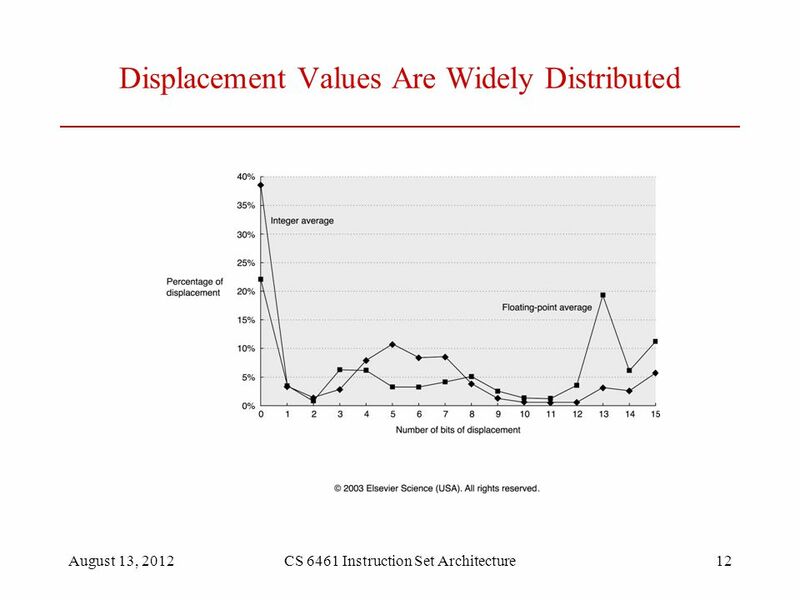 CEG3420 Lec2.1 ©UCB Fall 1997 ISA Review CEG3420 Computer Design Lecture 2. 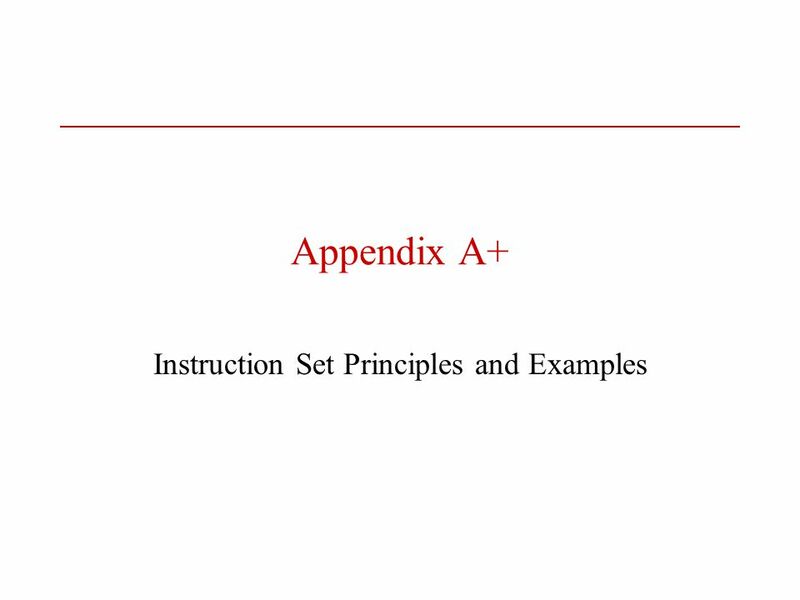 1 Instruction Set Principles and Examples 游象甫. 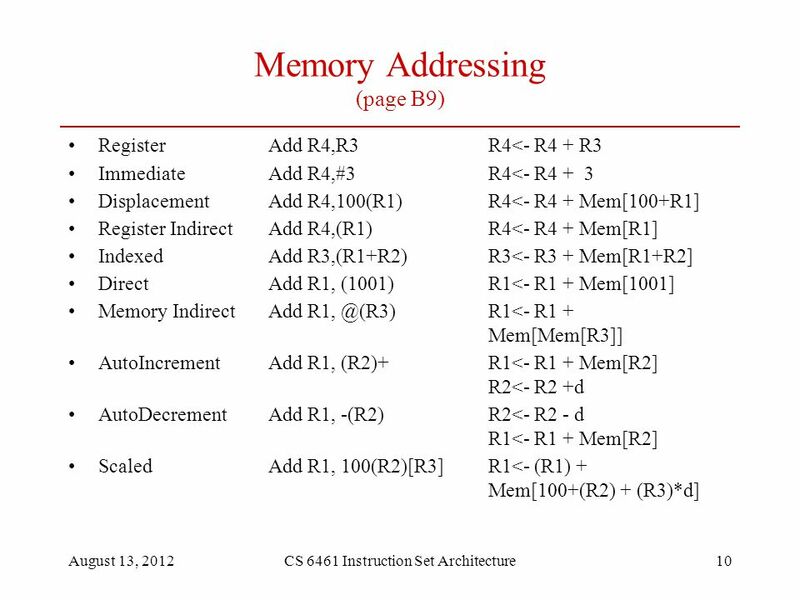 2 Outline Introduction Classifying instruction set architectures Memory addressing Type and size of operands. 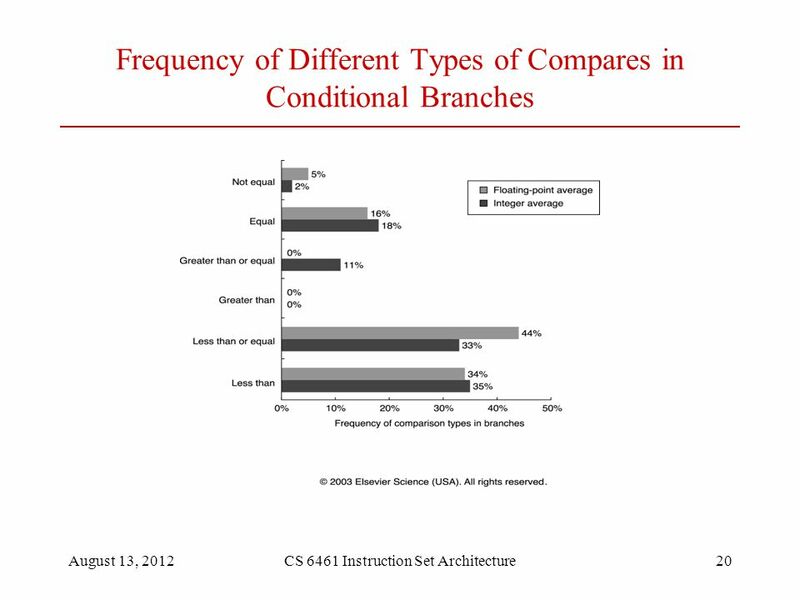 ISA Issues; Performance Considerations. 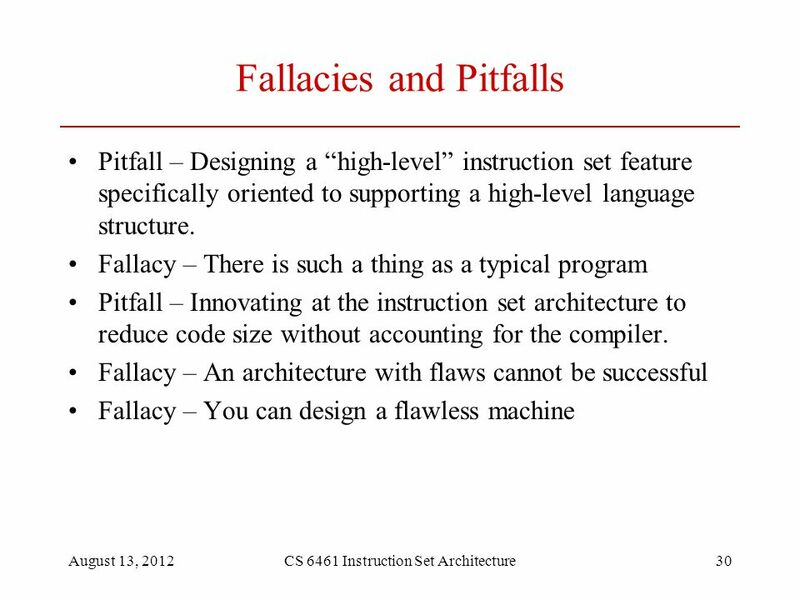 Testing / System Verilog: ECE385. 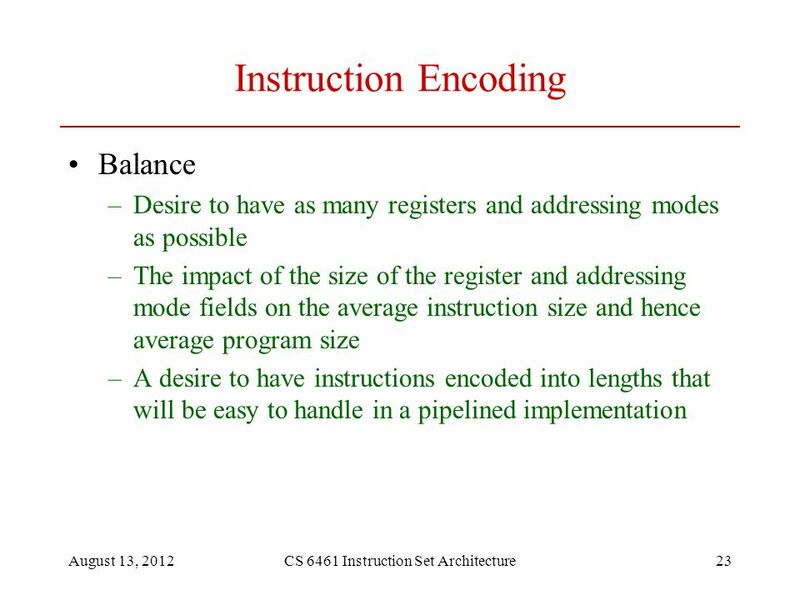 1 Lecture 3: Instruction Set Architecture ISA types, register usage, memory addressing, endian and alignment, quantitative evaluation. RISC / CISC Architecture By: Ramtin Raji Kermani Ramtin Raji Kermani Rayan Arasteh Rayan Arasteh An Introduction to Professor: Mr. Khayami Mr. Khayami. 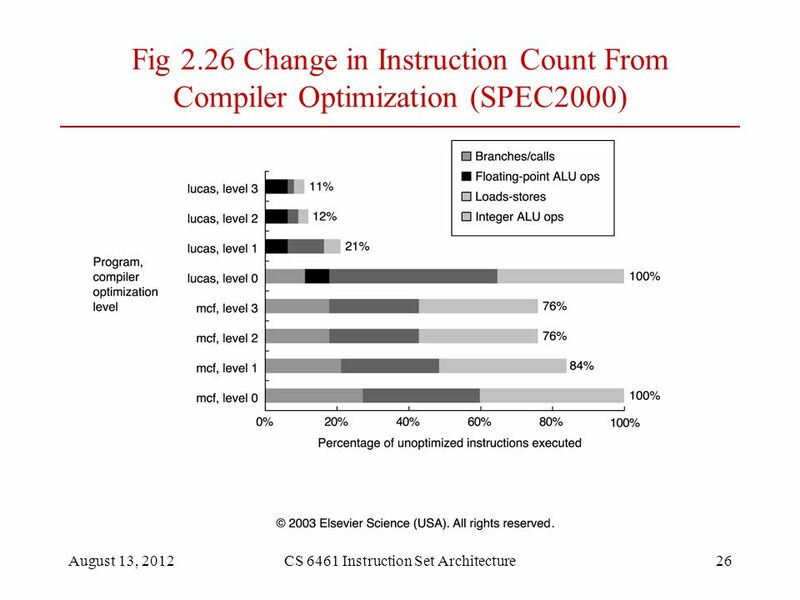 1 ECE462/562 ISA and Datapath Review Ali Akoglu. 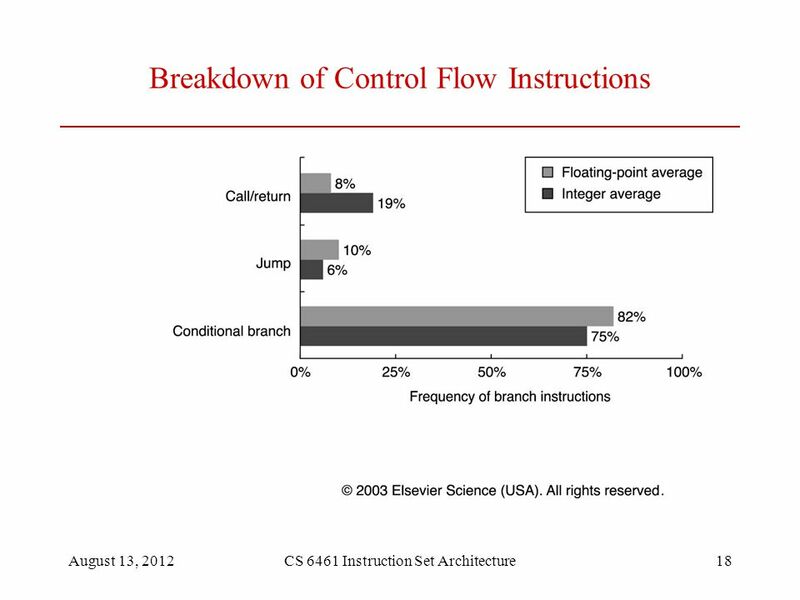 2 Instruction Set Architecture A very important abstraction –interface between hardware and low-level. 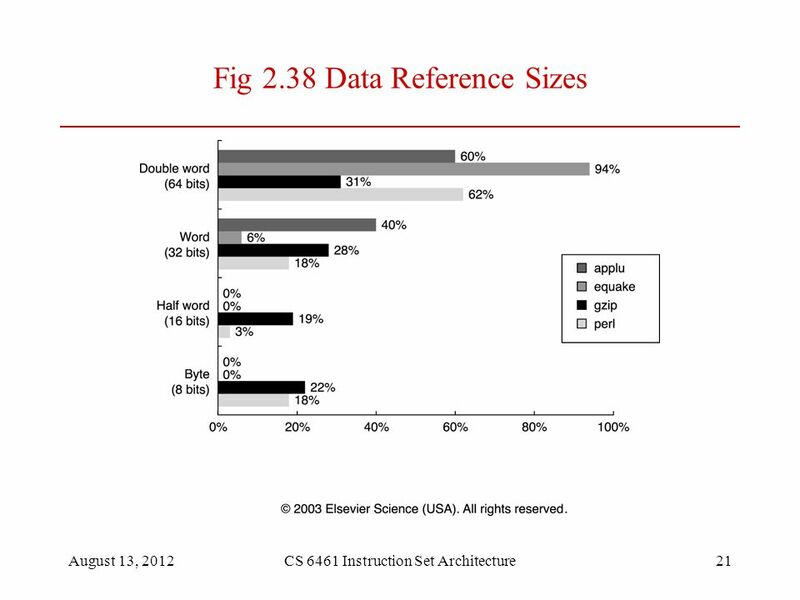 1 ECE369 ECE369 Chapter 2. 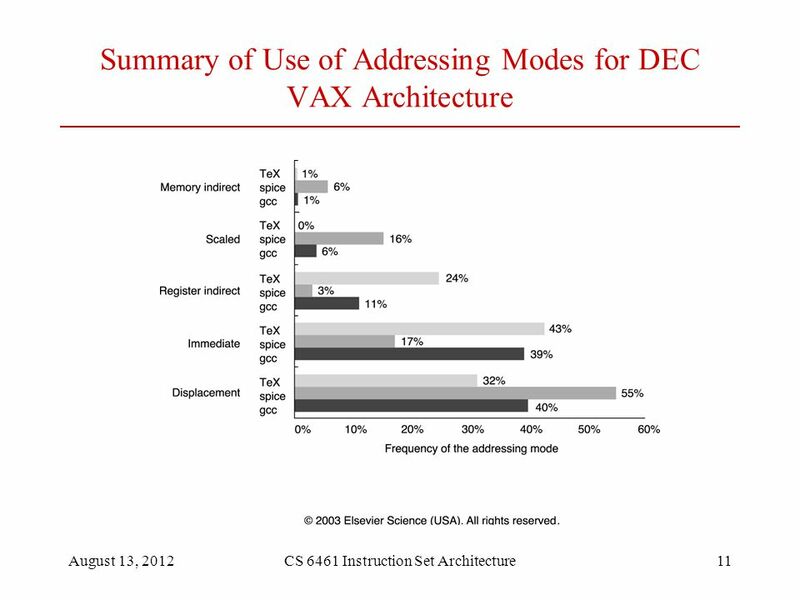 2 ECE369 Instruction Set Architecture A very important abstraction –interface between hardware and low-level software –standardizes. 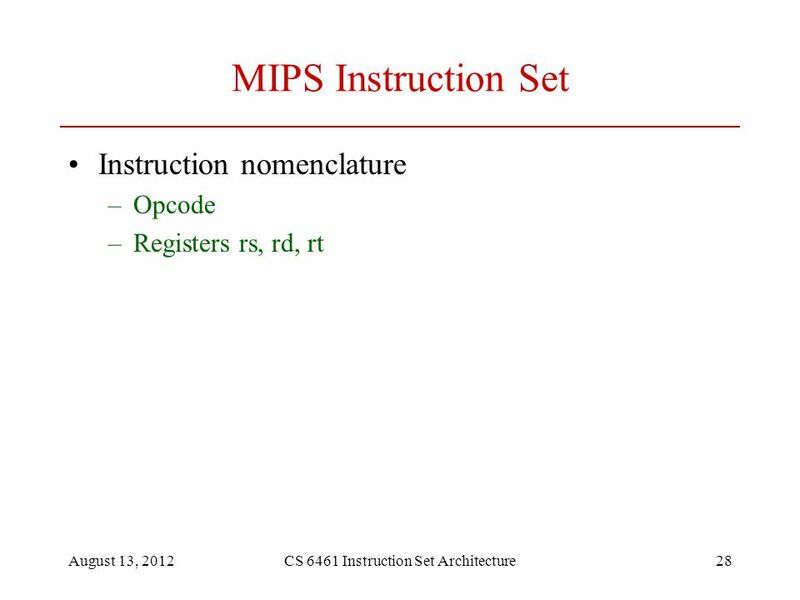 CS1104 – Computer Organization PART 2: Computer Architecture Lecture 5 MIPS ISA & Assembly Language Programming. 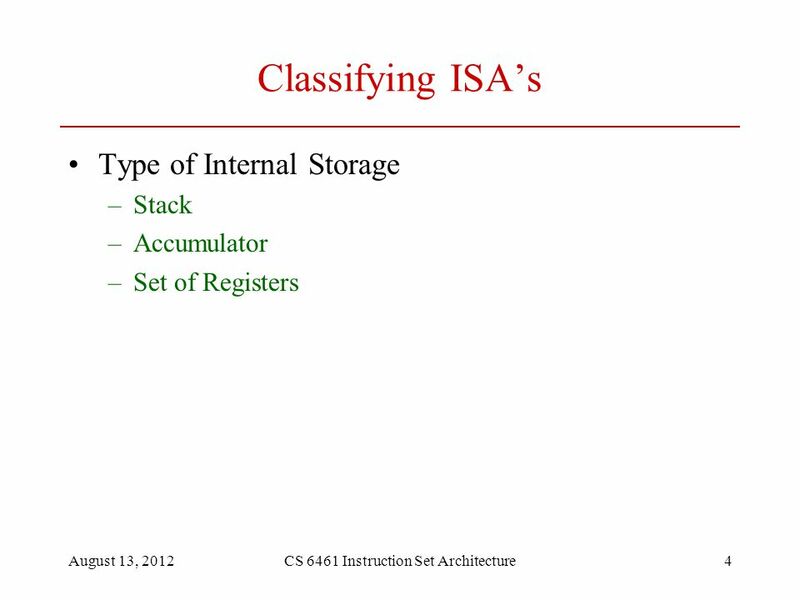 Instruction Set Architecture Classification According to the type of internal storage in a processor the basic types are Stack Accumulator General Purpose. 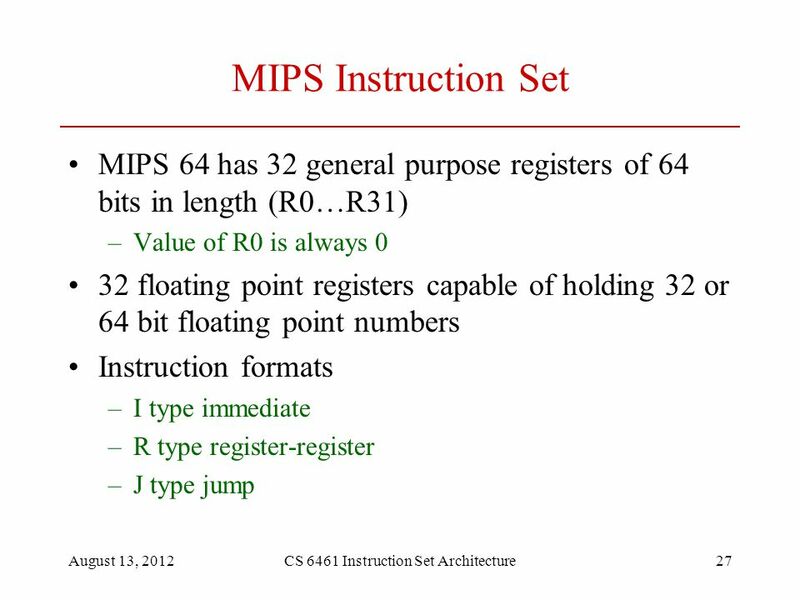 INTRODUCTION TO THE ARM PROCESSOR – Microprocessor Asst. Prof. Dr. Choopan Rattanapoka and Asst. Prof. Dr. Suphot Chunwiphat. Tuan Tran. 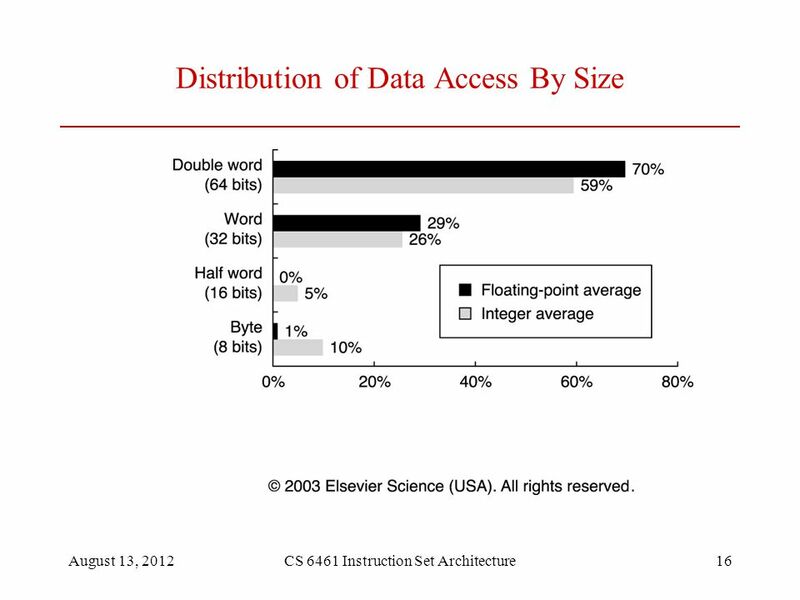 What is CISC? 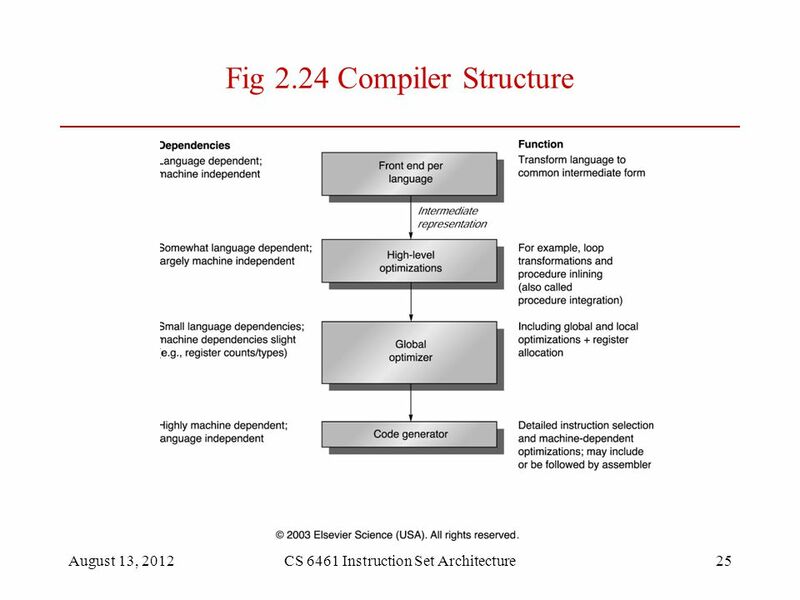 CISC stands for Complex Instruction Set Computer. 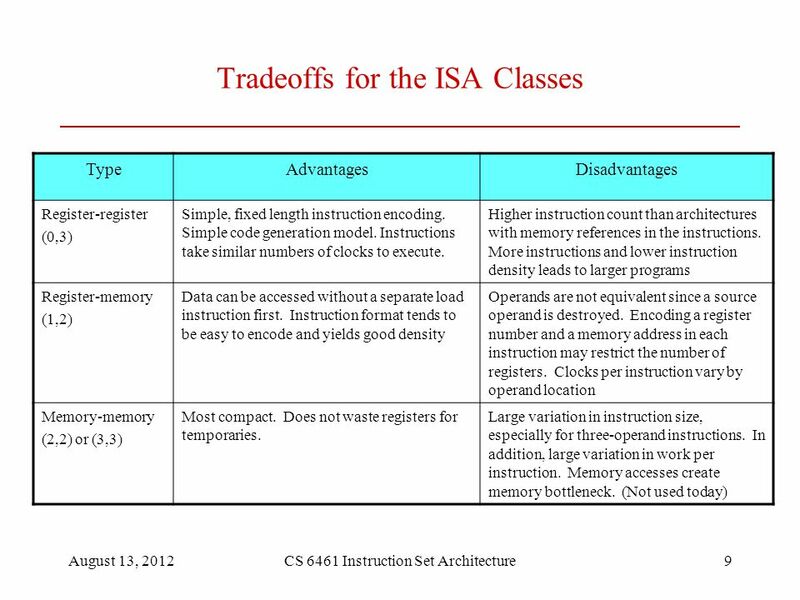 CISC are chips that are easy to program and which make efficient use of memory. 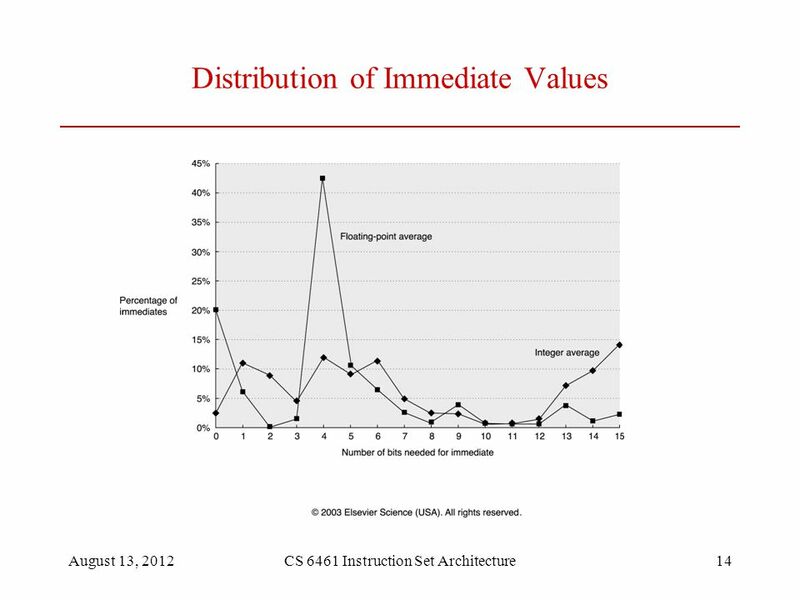 Recap Measuring and reporting performance Quantitative principles Performance vs Cost/Performance. 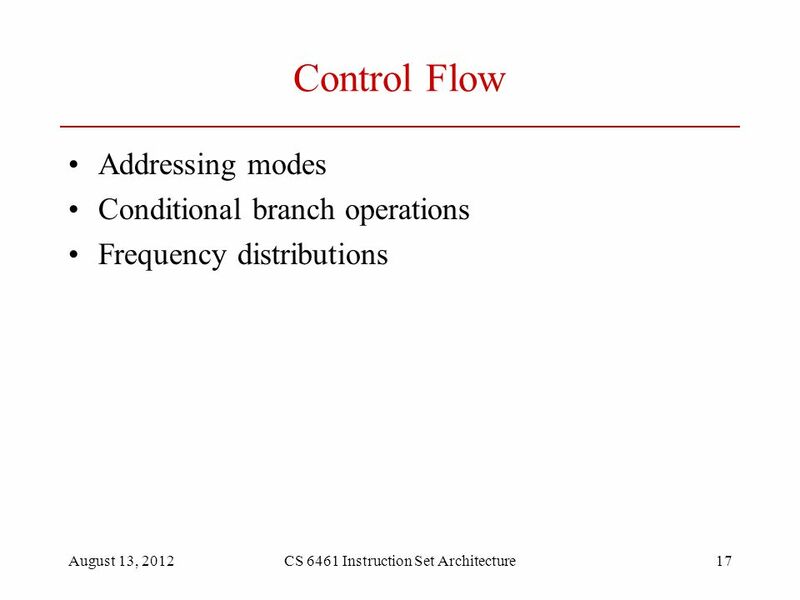 Multiple-Cycle Hardwired Control Digital Logic Design Instructor: Kasım Sinan YILDIRIM.